From Thomas Sabo is this stunning Pearl and Rose Quartz Charm Bracelet S. A perfect bracelet to wear with any outfit. The Thomas Sabo Pearl and Rose Quartz Charm Bracelet S features a Pink toned bracelet that is adorned with Rose Quartz beads. Spaced inbetween the Rose Quartz beads are 4 Pearl beads. The bracelet is perfect for attaching your favourite Thomas Sabo charms and would be the perfect gift for her. 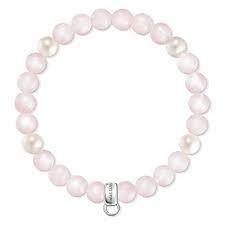 The bracelet is crafted from 925 Sterling Silver and Rose Quartz and Pearl beads.